Altec is a U.S. based manufacturing company. The company has set the standard for innovation in design, manufacturing, sales, and services. Altec delivers their products and services to over 100 countries around the globe. With the assistance of El Grande Group, Altec has established a new manufacturing factory in Mexico and is once again finding success. What sets Altec apart from other manufacturers? This company has found success through their emphasis on the principles of people first and customer satisfaction. First and foremost, customer satisfaction. The company hopes that employees find enjoyment in the workplace environment that emphasizes family, teamwork, integrity, and people first. How has El Grande Group assisted Altec? Expanding their manufacturing operations into Mexico was achieved through the guidance and administration support provided by El Grande Group. Natural gas is used for a variety of industrial purposes, especially in the manufacturing industry. El Grande Group has assisted Altec in lowering spending costs on utilities by securing better pricing for natural gas usage. El Grande’s Financing Program also assisted Altec in expanding their operation by providing the company with more manufacturing space without raising costs. El Grande’s assistance has allowed the company to pay as they grow. HR support from El Grande has helped Altec filter out their workforce and retain quality employees. El Grande Group also helped in a massive recruitment of qualified laborers and personnel to kickstart operations in Mexico. 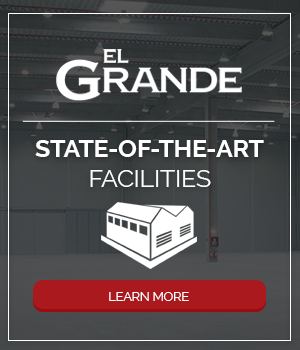 El Grande’s architecture has assisted Altec in optimizing their industrial space through the better placement of equipment such as machines, ovens, and other industrial technologies. This utilization of space has made operations more cost-efficient. Additionally, the purchasing manager has helped Altec obtain 2 new clients, one of them being the highly successful parts manufacturer, Centracore – a company that has also benefited from El Grande’s foreign manufacturing expertise. Altec personnel also benefit from personnel transportation services provided by El Grande. This makes getting to work easier for Altec employees. With the implementation of foreign manufacturing techniques and the expert assistance from the El Grande Group, Altec will continue to grow and expand their manufacturing production capabilities.